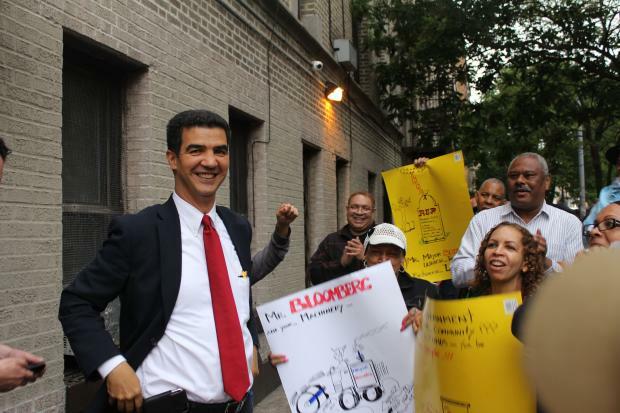 WASHINGTON HEIGHTS — City Councilman Ydanis Rodriguez and Assemblywoman Gabriela Rosa wanted a ceremony to honor the artistic talents of several Washington Heights schoolchildren Thursday night to focus on education. But the elected officials got more than they bargained for when dozens of education activists crashed the event to discuss just that. Carrying posters and air horns and chanting "Education Yes, Cuts No," the protestors were furious that the New York State Education Department rejected an application from the Northern Manhattan Improvement Corporation for $1 million dollars in funding to continue the adult programs. NMIC's adult education program serves more than 2,000 residents annually, giving them free access to English, GED and computer literacy classes. "This community can't lose these funds," said protestor Jacinta Bruno, a 30-year resident of Washington Heights. "I'm from this community and I learned my first words in English in that program. "When I first came here I couldn't even say 'a cup of coffee,'" she added. "And now I'm going to college." The protestors blocked the entrance to Rodriguez's West 177th Street district office for over half an hour, delaying the opening of an art gallery showcasing the work of students from P.S. 132 Juan Pablo Duarte. Rodriguez and Rosa were blindsided, but took the protests in stride. "I was really surprised because of the crowd but not surprised by their [demands]," Rosa said. She said she's had discussions with the staff of Assembly Speaker Sheldon Silver about cuts to immigrant services in the area. Rodriguez greeted the crowd in the rain, telling the protestors that the decision to deny the funds wasn't made at the city level and that neither he, Rosa, nor state Senator Adriano Espaillat had jurisdiction over the issue. The politicians invited the protestors back to the office next Thursday for a rally against cuts to immigrant services in Washington Heights and around the city. "Mobilizing our community and advocating for our rights is what I love to do," Rodriguez said afterward. "I'm committed to do whatever I can so that their application can have a second chance." Several protestors remained after the crowd dispersed to watch as Rodriguez honored the P.S. 132 students. The gallery of student work, "My City and Me," will be on display at Rodriguez's office through June.